Resin Two Player Starter Set - We've now added a resin version of the starter set at £69.99 which includes everything you need to play. The only difference is this version does not come with the Deathclaw (which was a bonus for the PVC set). 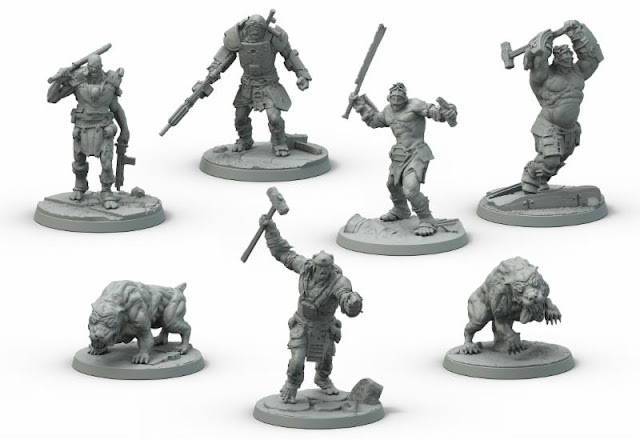 The Resin Two Player Set will only be available online as part of the pre-order initially due to the logistics of separating the components at the factory, and getting them packed in the UK instead. It comes as a bundle of products not in retail packaging. 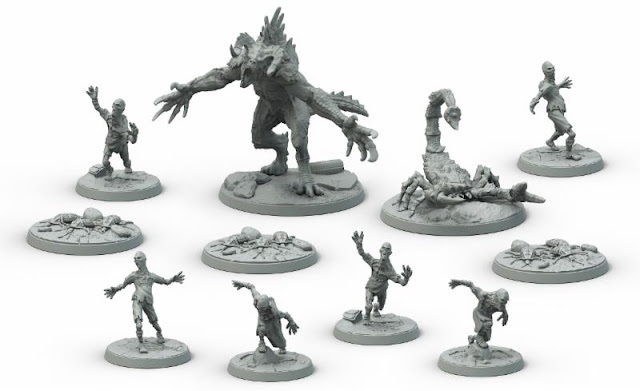 Alternatively you can get the Pre-assembled Hardened PVC Two Player Starter set pictured above for £60. The Starter Scenic Set - We added an extra Corvega Sedan to give you more to use on your tabletop and saves £40 on the total value. 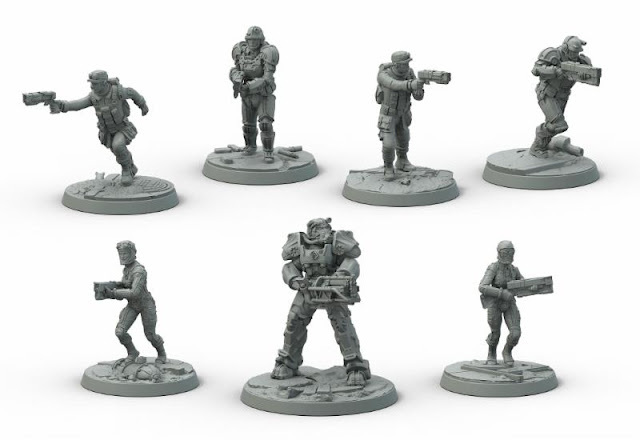 Vault Dweller Bundle - Should be £335 - this big bundle including all the faction miniatures sets was incorrectly priced and should have been just £335 not £395! Anyone who purchased it is being offered a refund of the difference. It now does include a £50 saving. 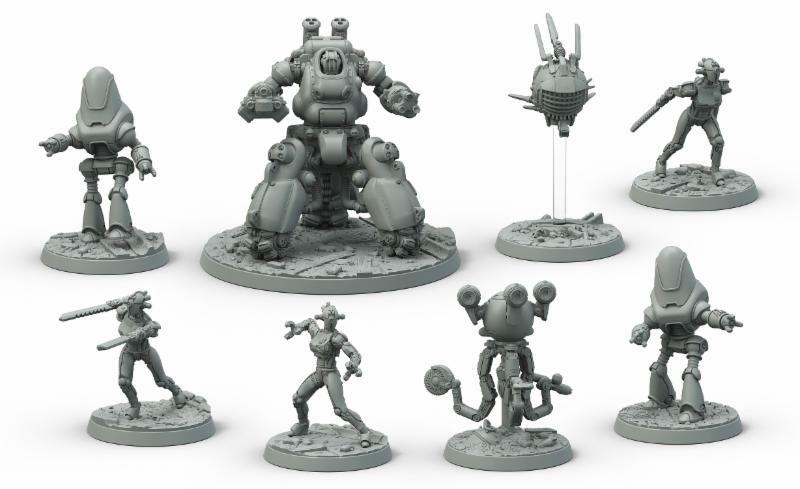 Vault-Tec Bundle - This massive bundle of all faction miniatures sets, creatures, robots, terrain and accessories has been updated to include a second Scenic Set (which also includes a second Corvega so you now get 4 total), and we've changed the Creature set out to include one of each of the Creature Blisters instead, it now saves you £185 on the total value. Missions - We've updated both starter sets to include more info. The starter set comes with 5 x Training missions following the Survivors and Super Mutants, 5 x Tournament Missions, 5 x AI Missions and 5 x Narrative Missions. 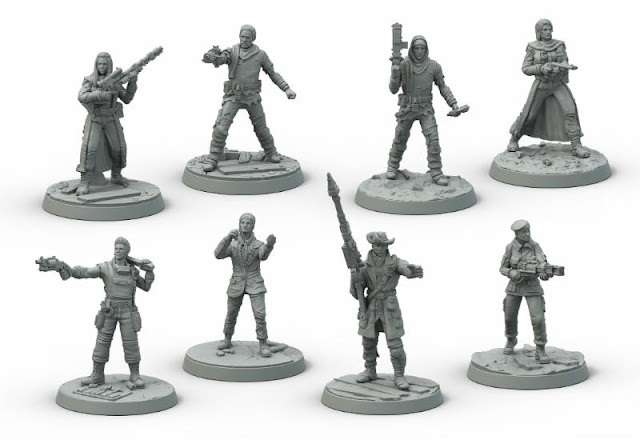 Every boxed set also comes with an A4 sheet featuring 1 or 2 bonus missions using those miniatures (or a caps based alternative) and there will be free downloads of extra missions. More on this later. The Survivors Starter Bundle expands your settlement force to include the Starter Box contents (Sole Survivor, Dogmeat, T60 and 2 Settlers vs 3 Super Mutants, 2 Hounds and a Deathclaw) plus the Survivor's sets including: Preston Garvey, Ronnie, Sturges and Mama Murphy plus four settlers, X6-88, Cait and Piper plus four Minutemen. This bundle is £125 and saves you £20. 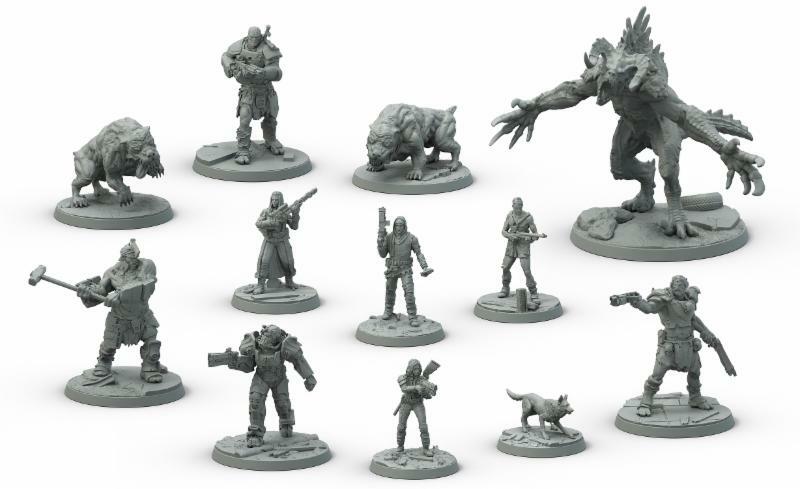 The Super Mutants Starter bundle includes the Starter Box contents (Sole Survivor, Dogmeat, T60 and 2 Settlers vs 3 Super Mutants, 2 Hounds and a Deathclaw) plus another 2 Super Mutants, a Super Mutant Brute and Master, 2 more Hounds, 3 Suiciders with Mini Nukes, Hammer the leader of the Super Mutants and another hound. This set comes in at £125 saving you £20. Terrorise the wasteland with the Web Only Wasteland Creature Set (there's also separate blisters) which lets you field different wasteland critters to fight against in AI mode or as an extra challenge in player vs player games. The bundle saves you £15. Activate new enemy encounters with the Wasteland Robots core box - this includes two Protectrons, an Eyebot, Mr Handy, three Assaultrons and a powerful Sentry Bot saving £12 on the set. You can use these as a player force or upgrade your AI forces. 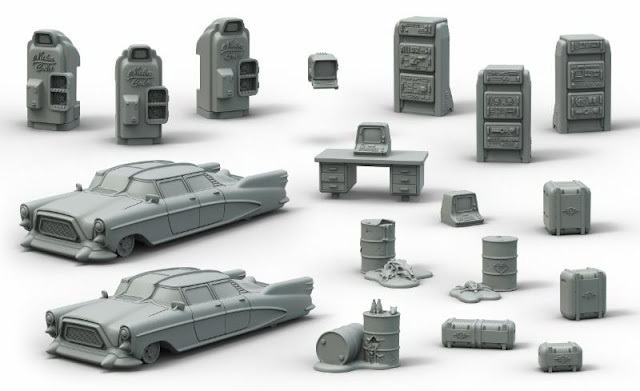 We teamed up with Battlesystems to create a set of clip-together pre-printed Fallout buildings that we'll be selling as part of the Fallout: Wasteland Warfare range alongside our resin scenery. 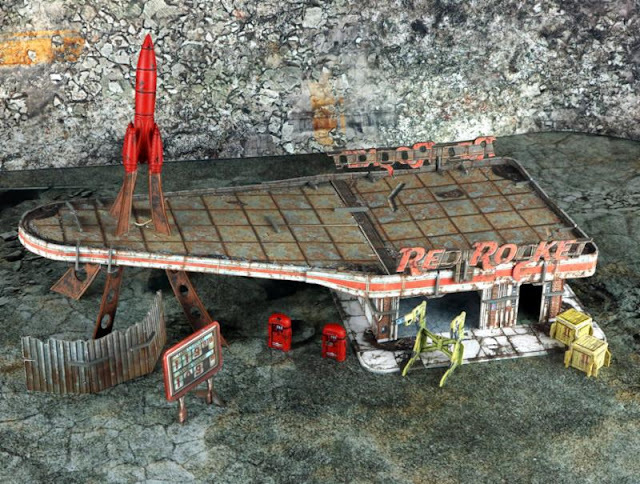 The first set is the Red Rocket Scenic Set and comes with a resin rocket and two resin gas pumps (pictured painted) alongside a card power armor frame and some walls and boxes. The Red Rocket itself consists of 5 printed sheets including all the floors, walls, signs and roof and you'll get a 3ft x 3ft neoprene gaming matt resembling the road and countryside around the Red Rocket but which can also double for other battle locations.